Eat and have custom-tailored clothes made. My favorite thing to do in Bangkok is eat. Last time I wrote about eating during the day in the Bangrak district. While there’s fantastic restaurants in Bangkok, an increasing high end dining scene that’s surprisingly affordable, probably half what you’d pay for fine dining elsewhere, there’s really no replacement for hole in the wall eateries and street vendors. And most of the action comes out at night. One of those vibrant areas is Chinatown around Yaowarat and Charoen Krung Road. There are so many things to eat that are cheap in Bangkok and fantastic. And there are so many new restaurants I haven’t tried yet that are pricier. But my meal at Nahm last time was so good that I decided I had to return. Nahm at the Metropolitan hotel is probably Thailand’s most celebrated restaurant. The Australian-born chef David Thompson is the first person to win a Michelin star for Thai cooking, a distinction earned for his former London outpost. This has been called the best restaurant in Asia and one of the best restaurants in the world. But it has neither the expense (assume about $70 per person without alcohol) nor the pretension of most of the other restaurants that wind up on these sorts of lists. The restaurant is casual and service is family style with several dishes brought to the table together. 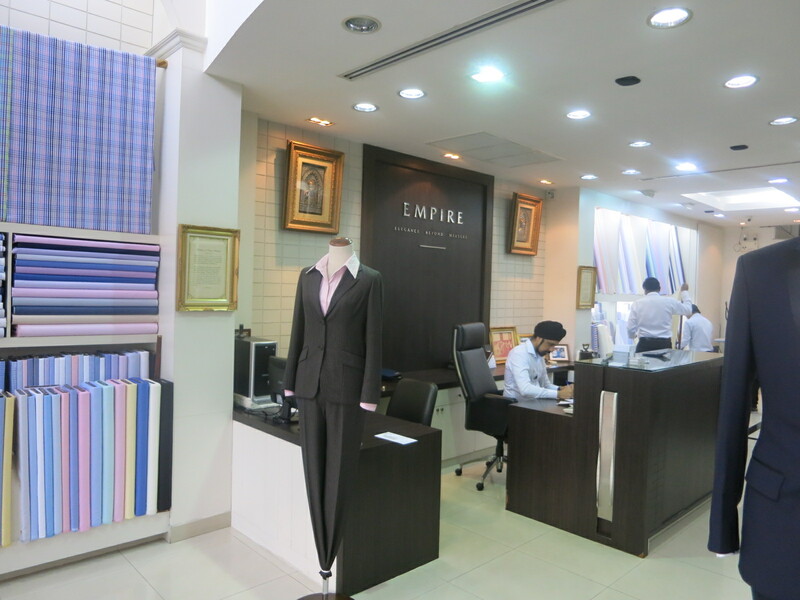 After a great experience a little over a year earlier, I returned to Empire Tailors to have more suits made. I had them make two suits, a jacket, and a few shirts. Since the trip I’ve decided on a few more items that I wanted, so I emailed them and they’ve made them again perfectly based on my measurements — a new tuxedo, some more shirts. The advice I’ve offered in the past is that while tailor shops will make clothes for you in whatever time you have, if you don’t have 4-5 days the first time they are making clothes for you then you probably aren’t really getting custom-made. Suits aren’t being properly made for you in a day. Suits are cheap but they aren’t dirt cheap if you want quality. Don’t buy a suit with shirt and tie thrown in for $99. It’s going to be a $99 suit, and more or less wastes your time getting it and the opportunity foregone for something better. Expect to pay for quality — while labor is cheap, good materials won’t necessarily be. I’m buying custom-made clothes for something like the price I’d pay at home for off the rack. I’m not buying the equivalent of a $3000+ suit. You can get suits at a variety of price points, with different degrees of quality tailoring and mostly degrees of quality fabrics. This shop is at the upper end of the market in Bangkok. But I would say that if you want quality materials and work product, without having a really keen eye, you’re unlikely to get it at under $350. SO thoroughly unimpressed with Nahm. Went about 18 months ago. Bad service, bad food. Food in Bali was much, much better – for food, service, and atmosphere. I just don’t get Nahm at all. Nahm looks fantastic although (water) seems a curious name for a great restaurant. Are there any reputable tailors that may have the same quality as Empire but not the overhead? @john you can try Buddy Tailor in Khao San Road. Been twice and the owner has visited me in New York. They have very nice suits at Tony’s on Soi Ragnam down the street from King Power. I have bought two lightweight cashmere suits there….great quality…..decent price for high end cloth. They usually throw in a shirt that is also custom made. Nahm is great. If you go at lunch it’s an even better deal. Similar to dinner with a course less, but quite a bit cheaper and very relaxed. For me the the food scene in Bangkok always starts with Sunday Brunch. St Regis has a nice one. What was the Four Seasons across the street historically had my favorite. Though Zuma at the St Regis has my new favorite, but only the first Sunday of each month. @Larryin NYC, David and EOW, Thanks for the tips. I wouldn’t buy a tailored suit on a “quick” trip to Bangkok. I did buy two back in 2007, and they were okay and they lasted a few years. But they weren’t ultimately cheaper than an off the peg in the US. The important bit is to tell the tailor you’re leaving at least 2 days earlier than you actually are, in case they mess up. The tailor asked when I was flying home (Sunday) so they’d have it ready the night before. So I told them I was flying home Thursday. The suits were okay, I didn’t lose out, but I didn’t gain either. I wouldn’t do it again. I’m always confused when a review says things like: “probably Thailand’s most celebrated restaurant”, and “the best restaurant in Asia and one of the best restaurants in the world”. Then I look up the reviews about it on Trip Advisor and see it rated #151 for Bangkok, with 13% of the reviews rating it either poor or terrible. @Robert Hanson – Tripadvisor can be useful for some things like photos of hotels. Restaurant recommendations? Clothing in the US is extremely inexpensive and it’s true that you can get an of the rack suit for a price similar to something custom-tailored in Bangkok. The difference is the fit and the ability to specify every aspect of the suit (for instance, the lining in the jacket). Personally, not being s frequent wearer of suits I more enjoy having shirts made. I feel there’s more scope for creativity. Another good idea is to get old favorites copied. I took a pair of fancy travel pants in a plastic fabric I didn’t like and had them colored in cotton/linen. The copy was 60% cheapest than the original.